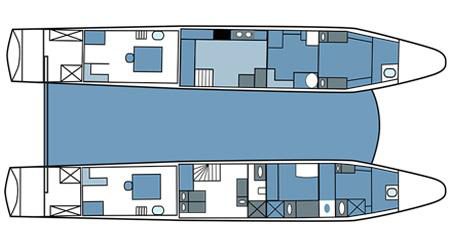 Guests can enjoy the well-furnished areas offering comfort and privacy in a small boat with a capacity of 16 passengers, allowing both intimacy and camaraderie at the same time. There are several resting areas for those who are looking for a quiet place to relax during their Galapagos trip with family and friends in the lazy mid-afternoon sun, or likewise after a busy day of swimming, snorkelling, kayaking, or walking on one of the Galapagos Islands. Whether you feel like getting a little sun or want the best place to enjoy the gorgeous sunsets over the Galapagos Islands, the sundecks are the best place to be. Each meal on board is a treat for the taste buds as the chef prepares the finest international and local dishes using fresh ingredients of the highest quality. All meals include the choice of meat, poultry or seafood. For the adults who might want to relax and kick back, they offer a great bar and lounge area where the bartender is happy to mix a tasty cocktail. Alternatively, you can call your personal Travel Specialist on 020 546 6222.